Our first full day in the Masai Mara started early (up for breakfast at 6am - this was going to be a trend for the holiday!) and then we set off for our day-long game drive. 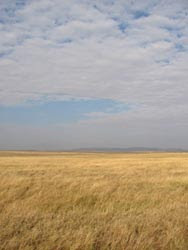 The Masai Mara is a beautiful place, the dry yellow grasses against the light blue sky reminded me of taking the back-roads past all the farms to Riebeck West in the Western Cape. We saw loads of animals, nothing I hadn't really seen before (aside from a cheetah in the wild). Mostly it was just fun for me to watch the foreigners rush to the one side of the truck when someone saw an Elephant so far away it might've been a tree ... or an Elephant, or a tree :) To me, seeing animals from that far away is a useless exercise. I want them up close. We did see hordes of Widebeest and their Zebra buddies. It is unbelievable, I have never before seen animals in this sort of quantity - aside from perhaps, ants. And from a distance, they really do look like ants because they queue. 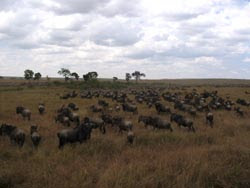 That's right, millions and millions of Wildebeest all in one long straight line. Well, just about. Unforutnately as spectacular as all that was, we didn't manage to see them crossing the Mara river - apparently that only happens for about 3 or 4 days of the year and is scheduled on a Wildebeest whim and cannot therefore be diarised. After the game driving we visited the Masai Manyata (village). We were shown around and the women welcomed us with a dance. We learnt loads of interesting Masai facts: 1) Every man in the village is descended from the chief. They are essentially all the chief's sons. Women join their husband's village when they marry 2) The women each build a house for themselves and their children. The men live in their wives houses. 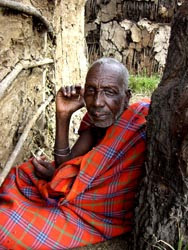 3) They Masai with large holes in their ear-lobes have not been educated. The ones who have attended school have one of their bottom tooth knocked out (ouch!). 4) They move their entire village every 9 years because the houses deteriorate and they need to move their cattle. 5) The dowry (number of cows) a Masai man must pay will depend on his skill as a "jumper". The highest jumper in the village doesn't have to pay any dowry. After our visit, the men walked us back to the Acacia campsite and put on a Warrior dance (complete with jumping).